BEA, Day Three: We’re Tired, but it was Worth it! (Jackie Krah) BEA wrapped up today. I couldn’t be too sad as we walked away with an absurd amount of great ARCs and professional contacts. (I believe Lauren wants to tell you about our shipping fiasco. The post office hated us.) The highlight moment of day three barely had competition for me. We decided to swing by the IDW Comics booth before we said goodbye to the coolest experience ever. Mike wanted to check out some info about the Dr. Who comic series, and I hadn’t gotten a chance to talk to their publicity reps yet. Wow, am I glad that we did. After talking to a spectacularly nice and helpful IDW representative I scored several volumes worth of reviewable comics. Look forward to upcoming reviews on True Blood vol. 1, a G.I Joe series by Max Brooks (son of Mel Brooks) and graphic novel additions to James Patterson’s Witch and Wizard books. Lauren also got some spectacular booty – but I believe she’s eager to tell you about that herself. Mike began to talk about other things as we turned the corner away from the IDW booth (where they could no longer see me therefore I could switch from the professional to the fan-girl side of my personality). Lauren held up her hand to tell him to hold on for just one second. Then she looked at me, knowing exactly what to expect. I, predictably, burst into a happy dance. I’m a big fan of IDW in general, and am extraordinarily excited to discover new series to delve into and share with you. Don’t be too jealous. We were absolutely thinking of our viewers the entire time. Many of the book ARCs that we procured we were also able to get a copy (usually signed) to give away on the site at the time of the review/ interview. We couldn’t do this with all the books, but whenever the opportunity presented itself, we grabbed a copy to share. (As I said. The post office HATES us.) More on these giveaways to come! A stack of our books after only the first two days! (Lauren Zurchin) I am tired. Dead on my feet (actually, I’m sitting in bed, watching a movie in our hotel room, but I digress). Because I just had one of the most rewarding, wonderful weeks of my life, which was capped off by today. There was only one official thing on the agenda this morning: Christopher Paolini was receiving an award from the Guinness Book of World Records for being the youngest author to ever have a best-selling series. How cool is that? I don’t know how he wasn’t giddy; I know I would be (though he did mention that he was talking about it so much at home that eventually his sister told him to shut up!). We got some nice pics, and then went off to visit the remainder of the convention. Considering we already had more books than we knew what to do with, we were thinking we wouldn’t end up picking any up today. Wrong! There were some being given away, including Lauren Oliver’s new Middle Grade book Liesl & Po. We also visited the blogger convention which was happening a level below. It wasn’t as well-developed as we expected, but it was still nice to get cards for potential future connections. Something extraordinary that happened to me, the book girl. I got given a breathtakingly beautiful hard-back graphic novel of The Last Unicorn. Anyone ever seen that movie? I loved it as a child, the beauty and the hauntingly dark parts. Even back then it drew me in. So to see there was a gorgeous version of the story, drawn to look pretty much the same, was amazing. And the guy at IDW gave it to me! Needless to say, I was over the moon, and I’ll be sure to review it soon. 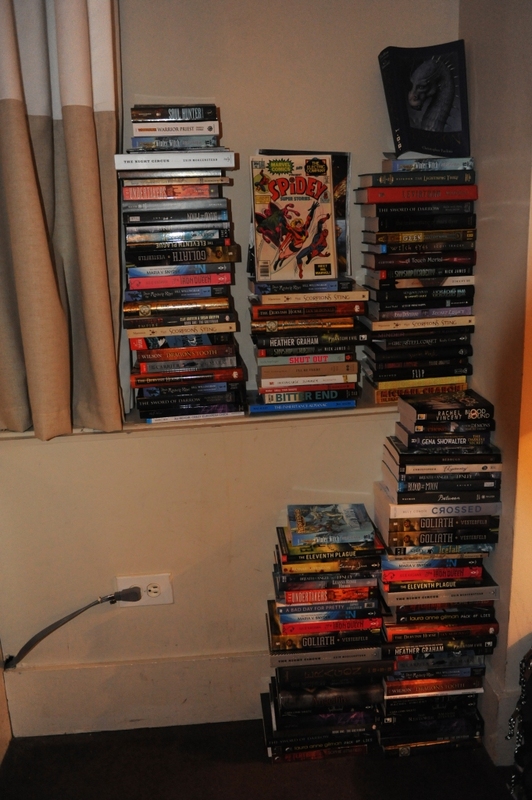 So, as you can see from the above photo, we had a TON of books. That photo doesn’t even include the ones we got today. So imagine trying to take all of those home on the bus. Granted, they were split between three people, but I had almost as many as Jackie and Mike combined. So after we left the convention center, we headed over to the post office to mail one of my suitcases home. It turned into a disaster. At first it was too heavy, and then it needed to be wrapped in bubble wrap and taped, and one person said one thing and another said another. So at the end we had a box filled to the brim with books, and a lighter suitcase wrapped and taped to be sent on its way. Over an hour later, we finally finished, to come back to the hotel and relax on our beds, where we haven’t left. There is so much I want to say about this event, but overall, it was one of the best experiences of my life. I cannot wait to share all of the wonderful things we got and learned with you, our lovely readers. Previous postThe Winners of the 2011 Nebula Awards Are Out!